Lions, and tigers, and bears, not quite! Travel down the red brick road with the world’s most iconic Good Witch, Glinda, as she embarks on a brave adventure in Oz in this start to a brand-new series from Gabriel Gale and Lisa Fiedler. On her Declaration Day, a day meant for celebration and happiness, Glinda’s peaceful life in Oz is shattered when her mother is imprisoned for practicing forbidden Magic. As she is ripped from her home by a fearsome bounty hunter sent by Aphidina, the Witch of the South, Glinda soon uncovers a startling truth: the Oz she’s always know is not good and right—it’s a world governed by the wickedest of the wicked, overrun with tyranny, corruption, and dark power. And Glinda’s mother? She is actually a high-ranking member of a secret society whose mission is to overthrow the four Wicked Witches and set the stage for the return of the rightful ruler of Oz. With the help of a feisty, purple-haired girl named Locasta, Glinda sets across the unforgiving landscape to rescue her mother. They are soon joined by Ben, a revolutionary New Yorker, and a mysterious girl called Shade. 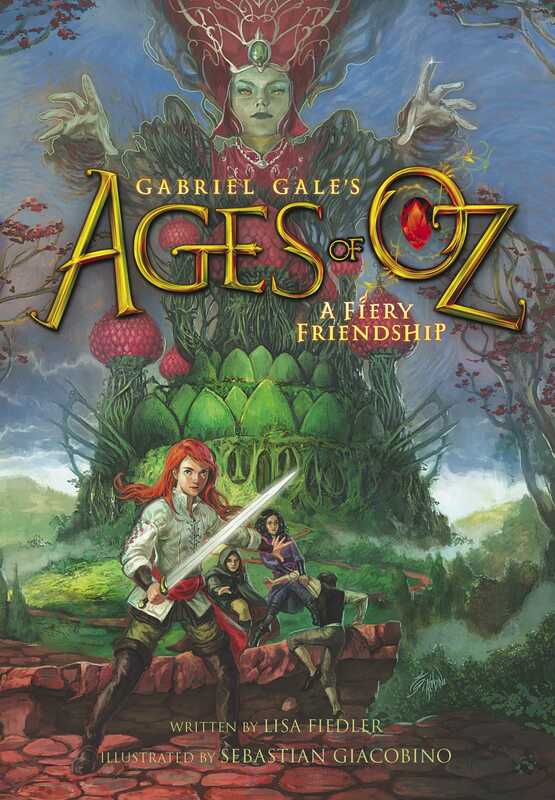 Armed with their individual gifts, these unlikely heroes mount an epic attack on Aphidina to free Glinda’s mother…and save the future of Oz from the Wickeds before it’s too late. If Glinda Gavaria had known how long it would be before she would ever again sleep the deep, peaceful sleep of the innocent and unaware, she might have elected to ignore the voice outside her window and simply remain in bed. It was a moment before Glinda realized her mother’s words had not come not from the parlor where she often sat up late, sewing by the fireside; they had come from outside on the back lawn. She tossed aside her bed linens, causing Haley Poppet to slip from the covers and land in a cottony heap on the rough wooden planks. Stepping over the rag doll, she padded to the window and peered out at the tiny yard. There beneath the ruby maple tree stood Glinda’s mother, Tilda, bedecked in a flowing cape of fabric so sheer it might easily have been spun from rainwater and cobwebs. Tilda tilted her head toward the uncommon brilliance of the midnight sky; her russet-gold hair swung back in a cascade of shining ringlets, revealing the delicate chain of platinum she always wore around her neck. Dangling from this was a glittering red stone cut in the shape of a teardrop. Glinda had never seen her mother without it, and there in the moonlight it seemed to gleam more brightly than ever before. Ages ago, all forms of mystical pursuit had been outlawed. Only the Witch Aphidina and those to whom she’d granted her express permission were still allowed to engage in Magical activities. For where else but in a dream would her mother invoke Princess Elucida, Fairy of the Moon? As far as Glinda knew, Elucida existed only as a character in an ancient piece of Ozian folklore. The response came swiftly: a trembling moonbeam gathered itself from the glow and settled gently upon Tilda’s open palm; an unbidden thrill shot through Glinda at the sight of it. Even in a dream, such potent Magic was wonderful to behold. Tilda closed her fingers around the streak of light, coaxing it into a glimmering ball. Then she lifted her willowy arms to the sky, and as she did, the graceful movement was reflected in the looking glass above Glinda’s dressing table, giving the bizarre impression that her mother was both inside and outside at the same time. The effect was so entrancing that suddenly Glinda wanted nothing more than to be outside in the moonlit yard beside her mother, though whether to prevent the Magic or to join in it she wasn’t entirely sure. The beauty and mystery of the act drew her to it, even as the threat of punishment caused a knot to form in her chest. Glinda ran through the parlor, past the spinning wheel and the dying fire on the hearth, into the kitchen with its heavy oaken door. She reached for the iron handle and pulled. But the door did not budge. She tried the window. Also locked tight. Pressing her face to the glass panes, she watched as her mother bowed her head. “I accept your secrets and your wisdom,” Tilda murmured, her fingers going to the red stone at her throat. “And I ask that these be made visible.” Then she tossed the shimmering ball of moonsparkle into the middle of the yard. A sudden breeze swept through the yard, rustling the branches of the ruby maple, rippling the grass beneath the swirl of Tilda’s gossamer cape. Glinda watched, astonished, as the moonlit yard began to transform into something unfamiliar. The curtain of the night seemed to crackle and splinter, as if the very atmosphere were breaking, twisting itself into a wavering phantasm. Where the moonbeam had landed, four dark figures were now assembled on the lawn, facing one another like points on a life-size compass. Their faces were featureless smudges, and in them Glinda sensed an undeniable ugliness, if not of countenance, then surely of character. The sinister foursome encircled three equally hazy shapes, though these were made not of darkness but of fear. They formed a trembling triangle within the outer circle. It was clear that these interlopers were unaware of Tilda standing just inches away. Somehow, Glinda understood that they did not exist in the now but in a realm somewhere beyond. Their presence revealed a moment yet to come, an event still in the making. This was a vision of the future; and Tilda, with the Moon Fairy’s aid, had called it forth! A flicker of motion near the ruby maple caught Glinda’s eye; a fifth specter was materializing like a shiver along one’s spine. But this newcomer did not join the circle; instead, it hid behind the tree, where Tilda could not see it. Glinda knew instinctively that this fifth being was a darkness beyond all imagination; a vile intrusion, an invasive tagalong, riding the glittering coattails of Elucida’s Magic. It was as faceless as the others except for the presence of two glowing orbs where its eyes belonged, pustules of red light that seemed to glare out of the future. Not quite eyes but eerily eye-like things, trained on Glinda’s mother, who continued to study the four ghastly figures in the circle. With a flutter of her fingers, Tilda uttered the word, “Identities,” and as she did, the gloom began to fall away from the figures, one by one. The first to appear was Daspina, the Wild Dancer of the West, rising from the murky depths of her own shadow. Her nimble body was clothed in a swirling gown of yellow, adorned with rows of snake scales. On her feet she wore a pair of Silver Shoes, and as though unable to resist the urge to dance, she swayed and shimmied in her place to some raucous music only she could hear. Across from her, on the eastern point of the mock compass, Ava Munch, the Royal Tyrant of the East, emerged like a spring zephyr with a winter chill. Known for her extraordinary beauty and her even more extraordinary ruthlessness, Ava carried herself proudly, cradling in her hands a Silver Mask. On her regal frame she wore a gown of opulent blue silk that matched her lapis-colored eyes. In the northern position loomed Marada, the Brash Warrior. Fully turned out in heavy armor, she was tall and muscular, short on grace but long on ferocity. Her face seemed to fight its way out of the blank darkness, presenting itself with a scowl on her thin purple lips. Covering her hands were a pair of Silver Gauntlets, which glinted in the moonlight. Glinda’s stomach lurched at the sight of them, the diabolical Witches from the North, East, and West. A feeling of dread filled her as she turned to watch the transformation of the fourth lifeless smudge—the one that occupied the southern point of the circle. This last visitor revealed herself from the ground upward, as if she were a weed growing out of the soil. First came the slim skirt of a red satin gown, climbing into a slender torso over which was draped a gleaming vest of finely woven Silver Chainmail. Proud shoulders sprouted next, then an elegant neck. Her head appeared, adorned with a tall headdress. Finally, Glinda saw the exquisitely angular face. The most familiar face of the whole horrid quartet: Aphidina. The Witch of the South. But that was impossible. Aphidina was known to despise the three other Witches, denouncing them as her sworn enemies. Aphidina, who was known by all to be fair and generous and wise, would never deign to associate with such evil. Aphidina was a worthy queen. And the others . . .
Lisa Fiedler is the author of many novels for children and young adults. She divides her time between Connecticut and the Rhode Island seashore, where she lives happily with her very patient husband, her brilliant and beloved daughter, and their two incredibly spoiled golden retrievers. – Sally Roesch Wagner, Executive Director Matilda Joslyn Gage Foundation.